Approximately 12,000 years ago the Vashon Glacier retreated from Puget Sound by scraping its way north into Canada leaving behind the basic landforms of Whidbey Island and its neighbors Camano and Gedney (Hat) Islands. Lodgepole and white pine forests first colonized the southern part of Whidbey Island, followed by Douglas fir, western hemlock, red cedar and red alder that filled in the landscape and created a dense forest. Fossil remains have been discovered over the years on Whidbey Island. These include ammonite, perhaps deposited by glacial ice a million years ago, and the tusks, teeth, and bones of wooly mammoths. Both the Island County Historical Society Museum in Coupeville and the South Whidbey Historical Society Museum in Langley display some of these finds. As the climate warmed and glaciers retreated, animal and plant life flourished. Abundant rainfall and a temperate climate grew dense forests, with a rich undergrowth. Deer, bear, elk, mink, otter, raccoons, and rabbits were plentiful as well as a variety of birds and marine life. The waters surrounding the island were abundant with fish, particularly salmon. The island was a haven for the region’s first humans. Humans arrived about 10,000 years ago, some migrating down the coast from Alaska, others spreading west from the interior of the continent. Those people who settled at the mouth of the Snohomish River on the western shores of Puget Sound relied on salmon as their most abundant and reliable food source. They moved easily by canoe beyond the mouth of the river to the southern ends of Camano and Whidbey Islands where they established camps. The population of these outlying villages fluctuated seasonally as the native peoples fished, collected clams and berries, and hunted deer. One such beach camp, TSEHT-skluhks meaning “ragged nose,” was located at Sandy Point one and one-half miles east of Langley. 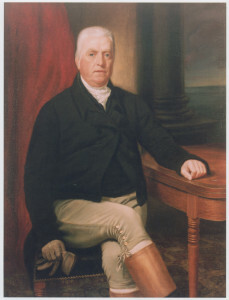 D uring his 1792 voyage to Puget Sound, British Captain George Vancouver sent Joseph Whidbey, Master of the ship Discovery, to explore and circumnavigate the large island that Vancouver later named in Whidbey’s honor. On May 29, 1792 Whidbey anchored near present-day Mukilteo and took the ship’s launches to explore what we now call Saratoga Passage. At Sandy Point Whidbey noted in his journals they were met by several hundred people who received them in a friendly manner both in canoes and by walking along the shore. During the following century illness killed off many local natives and in 1855 laws restricted the Snohomish peoples to their reservation near the mouth of the Snohomish River. So it was a raw, dense forest that greeted the first white settlers to South Whidbey in the 1880s. Logging camps and a few scattered homesteaders and squatters began taming the wilderness. In the late 1700s and early 1800s the native American population was decimated by disease transmitted through contact with European and American explorers. In some areas diphtheria, smallpox, and measles killed 90 percent of the native Americans.